Villagers are accepting handouts to vote for certain parties .... Same as before. 400 baht is the starting rate. One can guess which party is the predominant player. Use to be 500 baht? Lots of BG's would return home to collect it. This thread is so KR..
granting themselves with 1/3 of "the votes" prior to elections.. I think that both sides actually hand out the loot but as we know Isaan is a Thaksin/Reds stronghold. It could also be looked at as travel money as many/a lot of working age work well away from their home. I really need to wear my Glasses more . At first glance I thought the Title Read 'Elephant Fraud" . Strewth ! Partially true Dean though it has always been the village elder or another well known local figure dishing out the money on the promise of a vote for xyz party. Family members report they vote for xyz party because of the handout not because they actually know what happens in Bangkok (with politics). This practise was supposed to be illegal but a number of (political) parties have found the means. Contrary to Raks opinion I would like nothing more than a fair election free of vote buying. The Democrats tried to match handouts in one election year, long past, and failed to gain traction so it wasn't continued. Mr T had too a strong network of Pooyaibans and Kamnans well established throughout Isaan. Ppl in the south enjoyed a one-off election party drink! Of 22 workers on the building site next door, 15 have gone home to Udon for the election [party in village]. When we asked the contractor why his men all went home to vote instead of doing it here in CM, he said "not get whiskey money here". Didn't Thaksin say that "money politics" wasn't working anymore as people were taking money from multiple candidates and then voting the way they wanted. That is why he devised a way to pay people after the vote....The Rice Scheme. Ok ... well, fairer election. And no outcome is certain ... interesting day(s) ahead. If the new Constitution and electoral system is 'rigged', it's against Thaksin and his criminal ilk. Long may they be banished to the desert! ^You mean fairer as in a vote rigged in plain site... is fairer than a vote rigged by back-handers? No outcome is certain? Pretty certain that General Prayuth will win with this big a head start... there will be a military coup if he doesn't! I'm in the south that is yellow territory, from what I have heard from people here is that they think the dictator will be disappointed when he gets the results from the election. If he loses.. will they have to re-write the constitution again... to make sure next time? 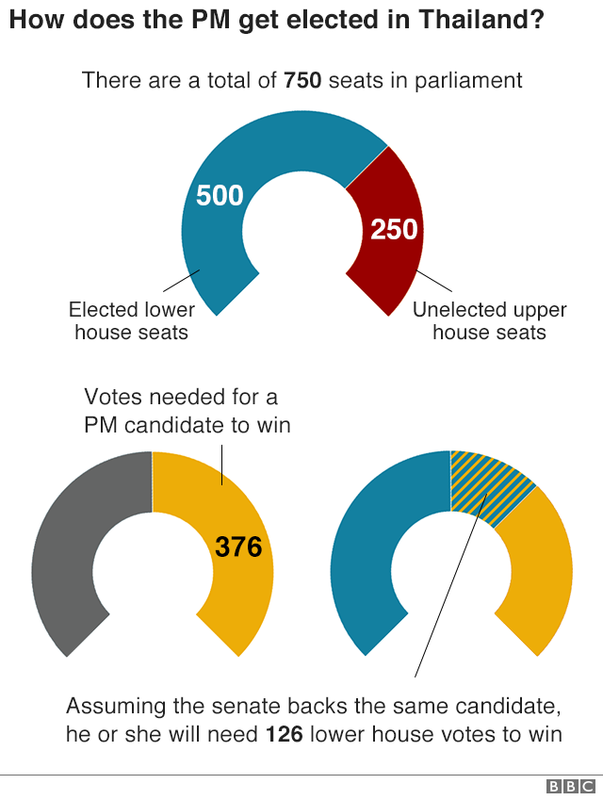 As it stands both sides don't have enough to form a government without forming some type of coalition with another party or parties. Bhumjaithai will probably be the decider on who forms the government which will be good for anyone that likes weed as their platform calls for marijuana to be Thailand's new cash crop. Last edited by Mr. Smiley; 25th March 2019 at 00:18. 1. One empty ballot paper is required before the election - easy enough to get at the porous Sala-glang. The paper is marked with the correct vote and given to the voter who then inserts it in the ballot box. To qualify for payment the voter must return his empty ballot paper, given by the officials, to the canvasser who then re-marks it for the next voter. 2. Another one a few years later used a cheap mobile phone with a camera. The camera (with flash disabled) would be slipped to the voter. The voter filled in their vote and took a picture of it. The camera would be handed back to the canvasser who, after checking and deleting the photo, would give the voter his voucher to collect the cash elsewhere. The procedure would be repeated for the next voter. I notice a couple of people in this election were busted for photographing their ballot so I suppose it is still going on. I had a good friend who was a hired gun type canvasser "hua kanan" for many years back in the days when we had regular elections. She was apolitical and worked for whoever paid the most money and explained to me a lot of the dodgy practices. Business for her started to go bad in the Thaksin years as they didn't need to buy votes. A lot of her jobs were with the Democrats or Chart Thai but they didn't really expect to win where we live so paid less. Nomad and Moo Uaon like this. ^ Yes correct , and the EC has warned a few times that cameras are not allowed in voting booths and taking pics is a criminal offence. My tg says that this never happened to her years back when she got 300 baht , then voted as she wanted to. But of course , like most Thais , she hasnt changed her 'address' , and wont bus it the 5 hours south to her home to vote. It looks like Prayuth won anyway.